Proposed EDC and DOC plan encompassing former jail. Image: NYC EDC. Developers must expand Brooklyn jail along with new development on adjacent sites. The New York City Economic Development Corporation and the Department of Correction issued a request to gauge interest in the potential development of two vacant parcels in downtown Brooklyn located next to the Brooklyn House of Detention, a 759-individual- cell detention center, which the City closed in 2003. DOC hopes to reopen and expand the existing 10-story, 280,000-square-foot detention center located along Atlantic Avenue between Smith Street and Boerum Place. The request requires that interested developers refurbish the facade of the detention center, redevelop its first three floors, add 11,300 sq.ft. 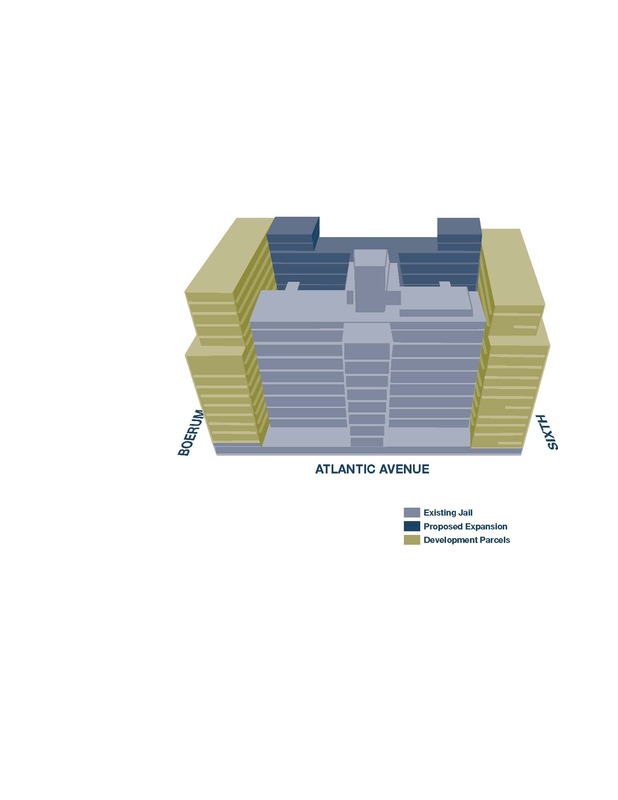 of retail to its Atlantic Avenue frontage and oversee construction of a 165,000- square-foot jail expansion along with any new development proposed for the adjacent parcels. On the two empty parcels, located directly east and west of the detention center along Smith Street and Boerum Place, EDC calculates that up to 238,500 sq.ft. of space can be developed. It asks developers to propose either residential or commercial projects with 15,700 sq.ft. of ground-floor retail. EDC anticipates splitting and selling the lots to the developer. The developer would also own the Atlantic Avenue retail space within the detention center. The current building is connected to the Kings County Criminal Court House through an underground tunnel that is still in use. DOC hopes to add 720 additional beds with the proposed expansion, a plan that would help to relieve overcrowding on Rikers Island. Responses should not propose development plans for the renovation and expansion of the House of Detention itself. An RFP will be released to find an architect for the proposed expansion. EDC set a deadline of July 18, 2007 for responses. Although the purpose of the request is to measure interest in the sites, EDC retained the right to choose a developer based on the responses. New York City Economic Development Corporation Request for Expressions of Interest, 275 Atlantic Avenue/The Brooklyn House of Detention, Downtown, Brooklyn (May 7, 2007).